Starbucks have recently faced a public outcry as it became known that they have not paid corporation tax in the UK for 14 out of the past 15 years. Amplified by media and government interrogations, they now face the rather bizarre choice last week of deciding how much corporation tax to pay, and appear to have concluded, for now at least, that £20m should cover it. One of the most interesting and underreported things about these recent events is that it appears to signal both the end of concept of shareholder value as the primary measure of company performance as well as the decline in legislation as the primary method of enforcing responsible business behaviour. The x-axis reflect short and long term value created – both commercial and social – by and for the organisation. The y-axis is how your organisation is perceived both locally and global. By local, we don’t mean just geographically local. Rather we mean the people and partners (e.g customers, suppliers, shareholders) with whom you have strong ties and existing business relationships. Conversely by global, we mean people or partners with whom you have weak ties, and perhaps have never worked with or even heard of yet. But within this wider and much more peripheral network lies potentially new customers, future innovation partners, and future investors. Short term returns/Local reputation – This is the business as usual quadrant where self-interested shareholders measure performance through the fluctuation in share price (or equivalent). Long term returns/Local reputation – This is the world of innovating new products, services and business models with partners which generates new shareholder value over time. Short term returns/Global reputation – This is the domain of your brand and how you are perceived by both your customers and wider partners. Some may question why brand is being classed as ‘short term’ however as Starbucks have learned, whilst it takes a long time to build a strong brand, it can very quickly be eroded. Long term returns/Global reputation – This is the domain of long term trust building with the widest possible network of new and existing partners. This captures both how you are perceived as value creating as well as the ease with which others find it to work with you. This domain is much more diffuse, and so harder to develop (and to measure), but it is also more robust over time because of the myriad of diverse connections. We weren’t exactly sure what this top right quadrant should be called – and would welcome any creative suggestions – but in the absence of any other inspiration we’ll refer to it as Network Capacity, as it reflects what people think and say about you and your organisation. And crucially this network capacity is inextricably linked to the integrity and authenticity of each and every person who is somehow associated with the organisation. In these economically lean times, some are referring The New Normal i.e. there is no new boom/growth coming any time soon. However I think the real new normal is a shift towards a reputation-centric approach to business. In this networked environment, accountability comes via your partners – both local and global, strong and weak – and not through legislation. And crucually it is openness and transparency, that enables you to build the long term trust and integrity that then drives forward the brand, new innovations, and ultimately shareholder value. Returning to where we began, with Starbucks, a few years ago their mystarbucksidea site attracted a lot of attention as an early example of crowdsourcing. Whilst it was certainly new and apparently popular, we questioned at the time whether it really represented a new way of working as it was simply an ideas competition for which there was no direct incentive and very limited commitment for Starbucks to act upon those ideas submitted. And now, just a few years later, even though Starbuck’s customers have probably always expected them to contribute fully to the country where they operate by paying corporation tax, they have only recently had access to the information and crucially have amassed the unprecedented coordinating power to force a rethink of this scale. So whether Starbucks can adjust to the new normal remains to be seen. So as a first step I think they have no choice but to give to get, and be much more open about their tax position, and look to rebuild trust and network capacity more widely than ever before. Whether we like it or not, that kind of openness is now becoming the new normal. And whilst it isn’t something most organisations like Starbucks necessarily want to do, or even have to do to comply with the law. Rather it is something they need to do in order to survive and thrive in a connected world. Whilst I think the 2*2 isn’t there yet, I think th observations in your opening paragraph are rather profound. I do hope that this odes indeed signal a shift in power. The trouble is that with Starbucks has a low viscocity of loyalty (as thin as coffee) so we can easily exercise our theatrical new collective power. Try that with banks or Windows or Google or your train operator. I was reading this thinking, that’s a smart observation and wondered who had written it, and smiled to see your name as the byline. I was right. smart. Glad you liked it! I did feel there was something there though agree I haven’t quite nailed what it is yet. 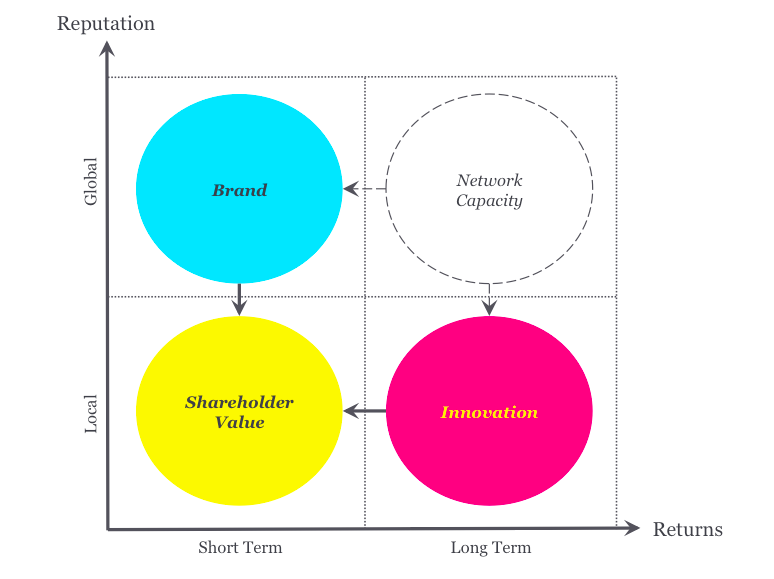 But broadly I think there is a sweet spot between brand and innovation where opening up creates lots of value but is a blind spot for most orgs. Agree too that the 2×2 isn’t quite there and yes, I suspect you might be right re Starbucks. Not sure about Google as they are so dominant in search space at least. Re banks, there are some nice examples of people (student) power forcing a U-turn at HSBC for example in Clay Shirky’s book Here Comes Everybody. Anyway hope you are well and thanks for dropping by the blog. As a former mathematician I have on occasions passed the time trying to visualise what it would be like to live in a 5-dimensional world. I never thought that this would come in useful, but here it does.. I think it’s a struggle to contain the reality we discussed within the chart because while shareholder value is one-dimensional and your chart is 2-dimensional, today’s reality is multidimensional, and there is no easy way of determining the best solution. To explain with an example, suppose that there are just 3 dimensions on which our organisation is judged: shareholder value, brand in eyes of customers and reputation in the wider community. So did we do better in year 1, or in year 2? It’s not clear. It’s not even clear how you might decide. That’s what has changed. The great (only?) attraction of shareholder value was that it gave us an unambiguous way of putting results in order – worse than, same as, better than. In the new world you can’t do this. So it’s no longer a question of maximising something, but a question of balancing multiple perspectives. Starbucks senior management will be struggling with this as I write -how much extra tax do we volunteer to pay, in exchange for how much improvment in reputation? It’s deeply subjective; there is no formula or algorithm. We have moved from the realm of economics to the realm of politics. I don’t know what it is yet Roland..I am still scratching my head a bit..but for me there is something about how what you write about would be interesting to link up with organisations like http://www.purpose.com..who have just launched a Purpose Europe now too.. It’s the systemic change stuff, that I think brands need to be much more aware of or engage with in a new way. Alastair – Love your comment. Thank you. I guess one of the points that I was trying to make and didn’t in the post (but hinted at in my comment to Graham above) is that there is a sweet spot between brand/customer/partner engagement and revenue generation that networks and openness has a big role to play but most organisations find it too complex and fuzzy to engage seriously. Looking at your two scenarios, I take the point but see a year 3 in which brand and shareholder value improve because of the very good reputation in year 2. But I certainly take your point that the chart is hugely over-simplistic and absolutely agree with your point about balance. fascinating blog and comment stream. I might suggest Connectedness for the top right quadrant, interpreted quantitatively as number/frequency of connections and qualitatively as strength of emotional bonds between an organisation and its network. Interestingly, he thinks Apple is on to a loser with it’s un-open approach, and therefore will probably remain in the lower left hand quadrant of your graphic for now.